Fiber Flux: Free Crochet Pattern...Vintage Blossom Keyhole Scarf! 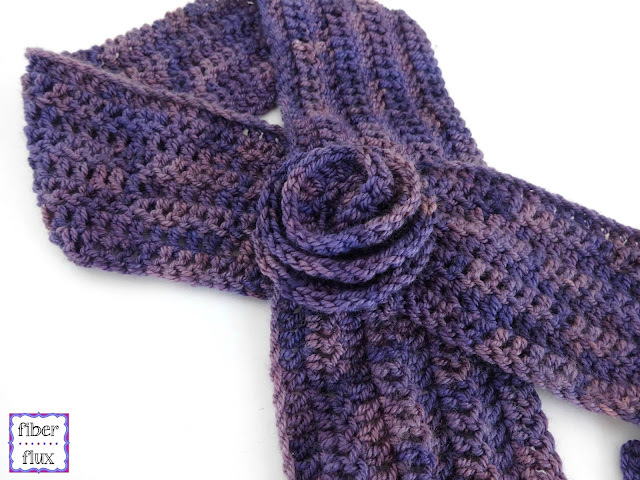 Free Crochet Pattern...Vintage Blossom Keyhole Scarf! 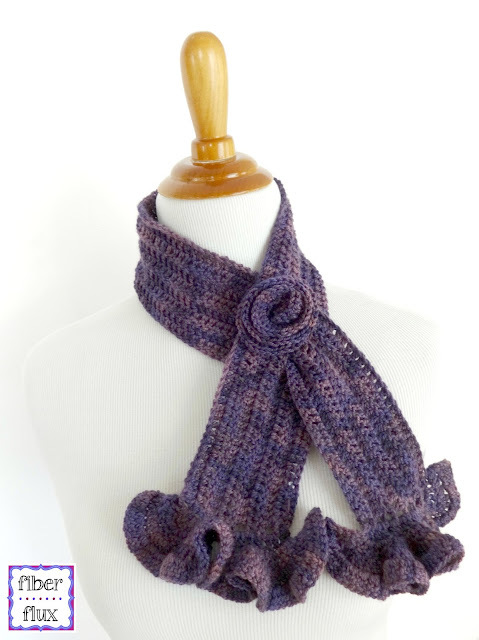 The Vintage Blossom Scarf is crocheted with luxury yarn has a fabulous vintage look and a lighter weight drape, perfect for warmer months when you need a little something or in cooler months as a beautiful accessory scarf. Originally featured on All Free Crochet, it now has a home on Fiber Flux too! 1 Skein Hat Box by Mrs. Crosby (“Midnight Aubergine” colorway) see below. You can substitute with any sport weight yarn too if you like. Get Mrs. Crosby's yarn for this project here! Note: If you don't want to crochet a long chain, try the foundation double crochet stitch instead. Row 1: In the fourth ch from the hook, work a dc. Work a dc in each ch across. Row 2: Ch 3 and turn. Work a dc in each st across, and in the top st of the t-ch at the end of the row. Row 5: Ch 3 and turn. Work a dc in the first 20 sts, then ch 10. skip 10 sts, then work a dc in each of the remaining sts. Row 6: Ch 3 and turn. Work a dc in each st until you get to the ch 10 from the previous row. In each of these chains, work a dc. Work a dc in each of the remaining sts. Row 8: Repeat row 2, and fasten off. Row 2: Ch 3 and turn. Work a dc in first st, then 2 dc in each st across. Work 2 dc in t-ch. Repeat row 2 twice more and fasten off. Repeat ruffle for other end of scarf. Row 1: In the 4th ch from the hook, work 2 dc. Work 3 dc in each ch across. Row 2: Ch 3 and turn. Work 2 dc in the first st. Work 3 dc in each st across and 3 dc in t-ch. Fasten off. Blossom will begin to coil as you work. Following this natural coil, keep tails intact and use them to stitch flower together with a tapestry needle. Do not weave tails in yet and proceed to assembly instructions below. Using a piece of matching yarn, sew blossom to scarf just to the left of the keyhole area. Weave in all ends. I bought some of Mrs. Crosby's yarn for this scarf. It's beautiful. Unfortunately, I got it so tangled I was unable to use it. I sat for a couple of days trying to get it untangled. Do you have any tips on how to unwind this yarn without it tangling so bad? I'm fairly new to crocheting and this is the first time I've tried yarn that comes wound like this.